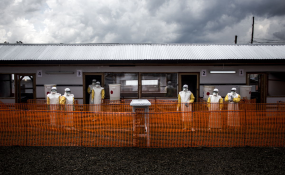 The Ebola virus disease (EVD) outbreak in North Kivu and Ituri provinces, Democratic Republic of the Congo persists and continues to be closely monitored. Since our last report on 8 January 2019, 33 additional EVD cases (32 confirmed and 1 probable) and 25 deaths have been reported. From the beginning of the outbreak to 14 January 2019, a total of 658 EVD cases, including 609 confirmed and 49 probable cases (Table 1), were reported from 17 health zones in the provinces of North Kivu and Ituri (Figure 1). Twelve of these health zones reported at least one confirmed case in the last 21 days (25 December 2018 – 14 January 2019). Over this period, a total of 72 confirmed and probable cases were reported, with the majority of the cases occurring in major urban centres and towns in Katwa (33), Butembo (13), Oicha (9), Beni (4), Kalunguta (3), Komanda (3), Mabalako (2), Biena (1), Kyondo (1), Musienene (1), Vuhovi (1), and Mangurujipa (1) – a newly affected health zone. Trends in case incidence reflect the continuation of the outbreak across these geographically dispersed areas (Figure 2). The decline in case incidence in Beni has continued, with the last case reported on 1 January 2019. However, these trends must be interpreted cautiously, as delayed detection of cases is expected following recent temporary disruption in response activities. A high number of cases is currently being reported from Katwa, though the outbreak remains active across all areas listed above. As of 14 January 2019, a cumulative total of 402 deaths were reported, including 353 deaths among confirmed cases. The case fatality ratio among confirmed cases is 58% (353/609). Since 1 December 2018, 36% (72/202) of cases have occurred in children <15 years of age. Of these, 16 cases were <1 year of age. A total of 29 pregnant women have been reported so far. To date, 57 infected healthcare workers (including 20 deaths) have been reported, with an additional laboratory worker and a nurse identified retrospectively during the last reporting week. On 14 January 2019, one death among a healthcare worker occurred in Katwa Health Zone. The Ministry of Health (MoH), WHO and partners continue to monitor and investigate all alerts in affected areas, in other provinces in the Democratic Republic of the Congo, and in neighbouring countries. Since the last report was published, alerts were investigated in several provinces of the Democratic Republic of the Congo, Uganda, and South Sudan. To date, all alerts outside the above-mentioned outbreak affected areas have been ruled out for EVD. Alerts for international travellers who may have potentially been exposed to the virus are also being followed up. A doctor who returned to the United States of America after providing medical assistance in the Democratic Republic of the Congo, mentioned in the previous report, has completed 21 days monitoring period without showing any symptoms.